In today’s App Review we introduce you to the game Deer Hunter 2016 for Android, iPhone and iPad. Here you have to kill a lot of animals in the style of a wilderness hunter, which are then added to your trophy cabinet. The fact that the game is purely virtual, of course not a single living animal is killed on the earth. After Deer Hunter 2014 they published Dino Hunter last year, in which you had to hunt dinosaurs. Now the developer Glu turns around, back to the basics. In this game you go through different wilderness worlds. But there is nothing really new in Deer Hunter 2016, read more in the review! Those who have already played the predecessors of Deer Hunter 2016 itself, will also become friends instantly with the new part, because there is not much new, unfortunately. Those who do not know the Deer Hunter series yet, expects a detailed tutorial at the beginning. Something bad, we find is that the shot in the lung right is not mentioned from the start. This not only brings extra money, but is also the typical procedure for a hunt. Gradually, then other functions of Deer Hunter 2016 will be unlocked. Among other things, you have to buy more weapons, must upgrade them, going to the Contracting hunting in order to earn extra money and go to the trophy hunting, which is necessary to unlock the next world. In total Deer Hunter 2016 starts with three worlds. You will start in region 1, Alaska. Then it goes to Texas and Colorado. Other worlds are certainly added through updates, this was already the case with its predecessors. When hunting in the App Deer Hunter 2016 you have to complete different jobs. Sometimes it is not just to kill one, but to kill two animals, sometimes you have to do a heart shot, sometimes a lung shot. Thanks to infrared, this is rarely a problem. But you have to choose exactly the right moment to fire, otherwise the animal moves away or by breathing you hit then but not the lung. While the frightened animals run away now, it looks different for the predators. These run up to you, in this case it comes to life or death. Very good, we find that now also the name of the animal is called, if we zoom back in. Since in some missions several animal species are in the wilderness, it has always been a mystery, whether the correct animal has been caught. If you are in zoom of Deer Hunter 2016, the species will now be given. 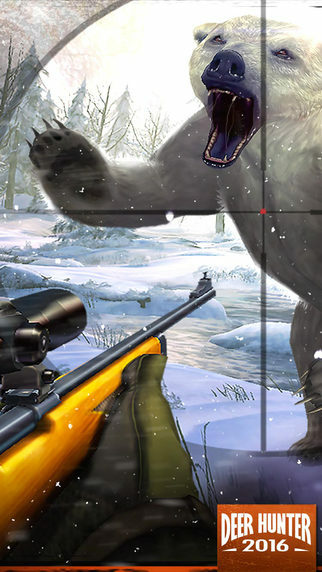 Graphically Deer Hunter 2016 for Android, iPhone and iPad remains an eye-candy. As with its predecessors, the animals seem lifelike, also the flora and fauna contributes to the mood of the game. Who already knows the predecessor, will not experiencing new surprises in Deer Hunter 2016 and can directly start playing. So there are new animals, new worlds and a slightly modified design. Otherwise, has changed very little, but that does not have to, because the franchise is great implemented for many years. The missions are varied and are becoming increasingly difficult in the long run. While there is only one animal at the beginning, you have to exactly think about how to proceed, in order to fulfill the later contracts. Deer Hunter 2016 is free to download, but is funded through in-app purchases and advertising. The content, which can be bought for money, such as the entry-level package or Premium monetary gold are not imperative, but speed up the progress immensely, because you so not have to be additionally at the contract chasing hunting money. A little sad is that Deer Hunter 2016 necessarily requires a connection to the server. The app can’t play offline, for example on the train or bus, where no Internet connection is available. Are there cheats for Deer Hunter 2016? Frequently the question is asked, whether there are Cheats for Deer Hunter 2016 to progress more quickly. We have to deny, however, because the app is funded through in-app purchases. So, if you want to progress faster and easier, you have to use real money. On the Internet, however, you find numerous hacks for Deer Hunter 2016 as for example, an APK that allows you to get unlimited money. But beware, these are not legal, and often hide Viruses and Trojans, which is a great danger, because they can cause unwanted costs for you. If you want to progress faster in Deer Hunter 2916, use the legal way instead of searching for cheat codes. 3 Comments on "Deer Hunter 2016: The next Version of the famous Hunting Game – App Review"
i can’t play without internet connection … why ?